This is a new online video slot developed by Williams Interactive, and it is available at good online casinos right now. This game offers the usual 5 spinning reels and has 25 active winning paylines. 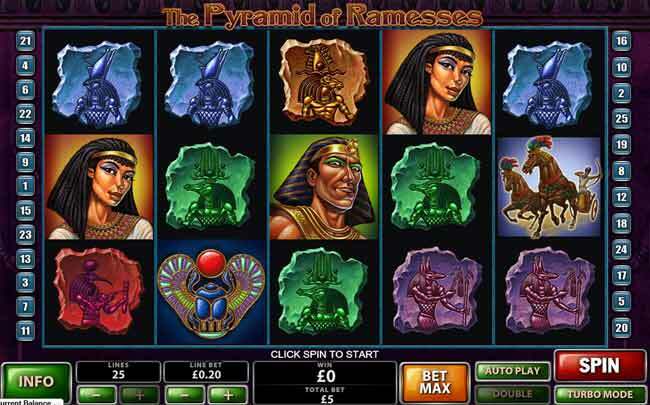 Interesting graphics with an Egyptian theme, which is very popular with online slots. The symbols are fresh and different and easily identifiable in different bright colours. In addition to the standard symbols you will also see the WILD and SCATTER symbols in regular play. The wild symbol will appear on reels 2, 3 and 4 and on a win will expand to fill the entire reel. The other main symbol is the scatter pyramid symbol. Spin three or more of these anywhere on the reels to get 15 FREE SPINS and a instant cash win of up to 100x your total bet. The next bonus is the CASH PYRAMID. 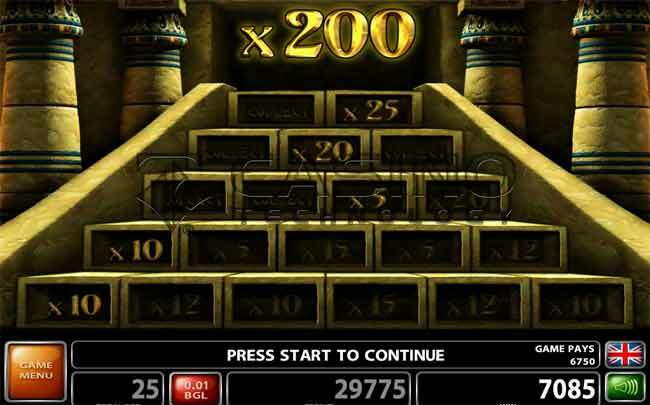 During free spins you will see extra pyramid symbols. Iff you spin three of these, one on each of reels 2, 3 and 4 you will be taken the PYRAMID BONUS. Start on the bottom row and pick a block to be awarded a win multiplier, then pick a block from the next row for another win multiplier. Keep doing this until you uncover a COLLECT symbol or you reach the top block for a 200x multiplier. This is a great game with some great instant wain feature and free spins bonus.